Inc., because it helps me build my business. Rolling Stone, because it helps me appear cool in front of my children (although I’m pretty sure I lost that battle at “print magazines”). Rolling Stone covers music, of course. But there is also, usually, an article about somebody otherwise famous. 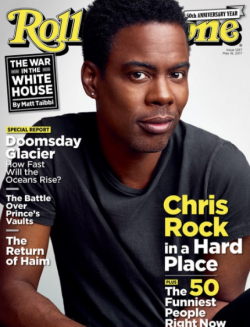 Last month’s featured famous person was comedian Chris Rock. There’s something about stand-up comedy that I find endlessly fascinating. In fact, were I slightly more troubled and considerably funnier, I might have contemplated it as a career choice. What I like most about stand-up is that it’s done without any partners, background visuals or equipment. It’s just one person and their thoughts, standing there and, if all goes well, making a living. And so I tend to pay close attention when comedians talk about their craft. How do they come up with the jokes? How do they keep it fresh? How do they try out new material? This is a guy who famously begins every tour with completely new material, unlike other comedians who just keep dropping new stuff in and around the long-time favorites. He meant themes. The words themselves change, but year after year, he keeps finding new ways to more or less make the same points. Isn’t that redundant? Absolutely. Absolutely. But redundancy – or consistency, if you want to think of it in a more positive way – is how you become known for something. It’s not the jokes per se; it’s the way he presents himself and delivers them, wrapped around the topics he consistently covers, that determine how likeable, memorable and compelling he is to you. When it comes to developing your “act” as a professional – whether you are a solo or the head of something bigger – the concept of “four or five jokes” is worth keeping in mind. Like Chris Rock, you don’t need to keep inventing from scratch. Quite the opposite, in fact. Having too many themes is going to water down your overall message, preventing people from associating you with any particular point of view. Does that mean you shouldn’t constantly be working to develop new ways to explain your work and put yourself out into the world? No. If you didn’t do that it would get boring. But notice that there is a difference between the underlying themes and the specific words through which you express them. The themes stay fairly constant; the words keep evolving. The good news is, you don’t need an endless supply of new material. Rather, like a great comedian, you need a handful of stuff – your stuff – that you continually mine, reconfigure and reiterate. You cheated and googled #1 before you answered, didn’t you? Let’s just stop this nonsense right here. I think you and Shel Silverstein had the same haircut? Now that’s really cool!!! And probably the same barber too, Martin! 3. I did not, I love that song! In my business the equivalent of being on the cover of the Rolling Stone is being quoted in the Wall Street Journal. I haven’t made it yet, but when I do, I’m gonna buy five copies for my mother! And maybe get a gen-u-ine Indian guru…. Have you seen the comedian documentary with Jerry Seinfeld?? Yes, anyone who was around in 1972 will remember that song. I have not seen the Seinfeld documentary, although I like his Comedians in Cars thing since you get that same behind the scenes look at the business. I’ll check it out! The montage of Rolling Stone covers on that video were a real treat! I agree. Lots of Dylan and Beatles through the years! I knew it was Dr Something and the Medicine Show. Couldn’t remember “Hook”. Also watch the Sylvia’s Mother video, that was a lesser hit of theirs. Still have some old Rolling Stone issues lying around here. You know you’re getting old (me) when you’ve never heard of half the people mentioned in RS! It was Dr. Hook and the Medicine Show…didn’t watch the video and, no I didn’t Google…great content/ concept…haven’t thought of themes versus jokes (or what I do, since I’m not all that funny). The idea is very interesting…I’m going to play around with this a little. Michael, you are so right: I tell the same thing to my clients, who are in job search: Be known for 1-2 things, because trying to be known for 10 or 12 or more only backfires to make you seem vague and confused — or, as Led Zep sang, “Dazed and Confused” (youtube.com/watch?v=YTtGSNICXEM) — which is actually the same thing. Sorry, couldn’t resist the rock music theme. Those Rock references never fail, Joanne. And that’s a great point about job searches, something I hadn’t considered. 1 through 4) No idea, and didn’t search for it on Google, either! But I did look it up on YouTube… and since Google owns YouTube, maybe I did look it up on Google after all. Hmm. 5) No, it’s not, because it’s funny. 6) Please don’t, because it’s funny. Re: content: the problem I find is that, with the exception of you, Michael, everybody seems to be saying the same thing. Boring business advice, rinse and repeat. How to get clients. How to keep clients. How to improve your SEO. 5 ways to do… whatever. 10 hot tips to… you get the idea. 7 best practices for… everything. Ad nauseam. YAWN. I agree with you on the newsletters – it’s a lot of the same. So the key is to find a way for yourself that’s different (hint: stories from your personal experience go a long way in that regard because they are unique). But even so, I think publishing something “pretty good” is still way better than going dark. A lot of this is just being visible and just we all say pretty much the same things when we attend networking meetings, there’s value in being there. I used to be an airline pilot, and I moved from the US to the UK to instruct corporate pilots. That job ended when the recession hit, so my two German Shepherds and I hit the road in a touring caravan and travelled around the UK for 3 years. The book’s about the first 6 weeks of those 3 years. Or it will be, anyway, when I finish writing it! I lived in the UK for a total of 5 years and I’ve visited it more than 25 times, and the newsletter is about my various UK adventures, with lots of other stuff (history, geography, dog-travel tips, that sort of thing) thrown in for good measure. 6. That’s what she said – Hayo! Did you ever watch the HBO Special with Chris Rock, Jerry Seinfeld, Louis CK, and hosted by Ricky Gervais? Can’t remember the name, but just them sharing tips and chatting for an hour. Louis CK actually has a practice of taking his ending material, which is supposed to be the best and opening with it, and that forces him to come up with a new, killer finish. Yes, I have seen that one. I love how they are all just sitting around in a living room somewhere chatting! Some nice background about all if it, there, thanks for the link! Priceless insight – four of five ‘jokes’ or ‘songs’ – brilliant! And applicable to other kinds of creativity too like clowning. Thanks! Agreed. I thought Chris Rock’s point was a good one and I’d never thought of it that way before! Dr. Hook, and I didn’t google it! Love this advice. I’m a freelance writer and doing the “5 jokes” thing is the #1 key to my success. I specialize in a couple of tight niches — business and finance, and a little bit of IT lately — so I’m not spreading myself thin trying to stay on top of multiple industries. Most importantly, I write about the same broad topics (the same jokes) over and over and over again. So I’m not constantly reinventing the wheel. Because I know these topics inside-out, I produce work super fast, which leads to super productivity and super billings. And I’m getting a reputation as the go-to resource for this kind of writing, so my work pipeline is always full. Good stuff as always! Glad it’s working so well for you, Don! And bonus points to you for the unassisted Dr. Hook info.